There are quite a number of things to consider when it comes to buying your first kayak. There’s the brand, the type, the purpose and features to consider, and more often than not all the choices available make the choosing process quite overwhelming. Aside from that, you’ll also have to decide whether to get a sit in kayak or a sit on top kayak. But which of these two types of kayak is the better option, and is there any significant difference between a sit in vs. sit on kayak? 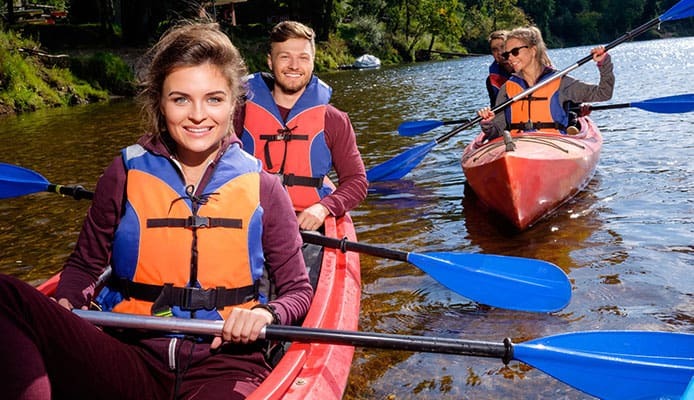 The truth is that the decision to get a sit in kayak or a sit on kayak is a matter of personal preference since both types can be used in various normal paddling situations. However, there are cases where one is better than the other and vice versa as you’ll see later. In addition, the choice between a sit in kayak and a sit on top kayak will be influenced largely by where you will be paddling and your paddling style. Despite the difference in appearance, sit in kayaks and sit on top kayaks have pretty much the same parts. For instance, both kayaks have a deck (the upper portion of the kayak) and a hull (the bottom portion of the kayak). Both kayaks also have a bow (the front end of the kayak) and a stern (the rear end of the kayak). However, there are certainly some major differences between sit-inside and sit-on-top kayaks. The biggest difference between the two types of kayaks is that sit in kayaks are enclosed while sit on top kayaks have open decks. That said, the sit in kayak refers to the traditional kayaks which were first used thousands of years ago by arctic and subarctic people for hunting and transportation. One of the best things about kayaks is that they’re versatile and can be used in various bodies of water, from small ponds to large lakes and fast moving rivers. However, you need to consider that the water and weather conditions in your kayaking destination will have a significant effect on your choice of kayak. If you’re paddling in cold water and weather, you’ll definitely want to use a sit in kayak. Because you’re sitting inside the kayak, your legs are protected from the cold and the water. Generally, this should be enough to keep your legs warm, but you can also use a spray skirt in order to further prevent water and cold winds from attacking your legs. Some spray skirts can be stretched around the cockpit rim in order to fully close off the inside of the hull for better protection. On the other hand, a sit on top kayak is generally recommended only if you’re paddling in warm waters and during the warmer parts of the year. This is because the open deck design of sit on top kayaks will definitely make it much harder to remain dry while paddling. Each wave, riffle or splash will surely get the paddler increasingly wet. When it comes to extended kayaking adventures like long day trips or overnight or multi-day kayak camping trips, you’ll want to consider getting a sit in kayak. There are various reasons why this is so. For one, a sit in kayak will have more room for storing food and other kayaking gear or camping equipment. They have built-in hatches that come with hatch covers which protects your belongings from water and other environmental elements. This is something that sit on top kayaks don’t do well. Their open deck design leaves all your belongings exposed and won’t be able to keep them dry. Aside from the large storage capacity, another thing that makes sit in kayaks great for extended kayaking trips is their speed. In general, sit in kayaks are narrow or have a slim design profile. Compared to the wide bodies of sit on top kayaks, the streamlined design of sit in kayaks allows them to travel over water faster. They have good tracking capabilities, which means that paddlers don’t have to expend much effort and energy to propel their kayaks forward and keep them moving. Also, due to their significantly lower center of gravity, sit in kayaks are easier to paddle and much faster than sit on top kayaks. Sit on top kayaks are more cumbersome on the water, as they are designed to be wider to compensate for the paddler’s high center of gravity. This curbs speeds and makes them difficult to paddle. Because of their inherent design, sit on top kayaks are the preferred choice for recreational kayak fishing. Their open deck design provides anglers with greater freedom to move around and fumble with their fishing equipment without fear of capsizing the boat. With a sit on top kayak, you should be able stand up and get in a perfect position to reel in big fish and haul them into your kayak with ease. In addition, the open deck design makes it easier for anglers who want to disembark and board their kayaks should they decide to wade into the shallows for some wade fishing. Unfortunately, sit on top kayaks don’t provide a lot of dry storage options which means that you’ll need to keep all the stuff that you don’t want to get wet in a waterproof bag or container. Still, sit on top kayaks shoud allow you to store and quickly access simple gear like water bottles and fishing rods. If you’re idea of a great kayaking adventure involves conquering whitewater rapids, you’re going to need a suitable sit in kayak. For this activity, a sit on top kayak simply will not do. Many beginning kayakers who want to eventually learn to become experts on rough whitewater start with recreational sit in boats before graduating to actual whitewater kayaks. Whitewater kayaks tend to have bigger cockpits for easier access and wider hulls for greater stability. Also, the enclosed cockpit design of sit in kayaks also provides the paddler with the ability to place their knees against the underside of the deck which greatly increases the paddler’s control of the kayak as well as its maneuverability. You’ve also got a lower center of gravity, which translates to better stability and more efficient paddling. One of the things that scare people away from kayaking are those videos showing kayakers flipping over while inside the kayak. True, this can be rather scary and the thought of drowning is certainly more than enough to prevent anyone from giving this sport a try. However, there really isn’t any need to worry since this is quite normal and happens more often than one would think. Besides, kayakers who are using sit in kayaks undergo training and practice about what to do when this happens and can easily bail themselves out or flip their kayaks back to an upright position. In addition, there are sit in kayaks which have wider than normal cockpits which allows kayakers to easily pop out of the kayak when it flips over. Still, for those who are unnerved by the prospect of flipping over and going underwater while riding a sit in kayak, there’s always the sit on top kayak. Self-rescue is one of the chief virtues of the sit on top kayak. Because of the open deck design of sit on top kayaks, you don’t have to worry about your legs being trapped when you flip over or capsize. And if you fall into the water you can pull yourself back up onto the deck of your sit on top kayak and reposition yourself for paddling. Getting yourself back onto your sit on top kayak may not be easy or graceful, but it sure beats having to pull yourself out of a sit in kayak while underwater. Sit in kayaks tend to be more expensive than sit on top kayaks. The difference is price is usually because of the specialized design, the materials used to make the kayak, and the other features and extra options available. However, don’t let this intimidate you if you really want a sit in kayak since there are affordable options available. Because sit on top kayaks are cheaper, they make a great choice for those who are on a budget and are looking for a simple watercraft for recreational uses. This is also a great choice for beginning kayakers who are still not sure how far they want to progress into the sport. So Which Kayak Should You Choose? In sum, if you plan to use your kayak mostly for recreational paddling and taking long kayaking trips, you should consider buying a sit in kayak. The high storage capacity makes it suitable for transporting various kayaking and camping gear and keeps them from getting wet. Sit in kayaks also travel faster over the water, so you should be able to cover a significant amount of distance without tiring yourself. On the other hand, if you’re looking for a kayak to use for recreational fishing, diving or swimming, then you’ll definitely want a sit on top kayak. These kayaks give you more freedom to move around and provide easy access to your fishing gear and lunch. A sit on top kayak is also great for those who are just starting with kayaking. It is more stable than a sit in kayak which makes it less intimidating to ride and it’s also less expensive than a sit in kayak so you don’t have to waste a significant amount of money on your first kayak purchase. By knowing the differences between sit in vs. sit on kayaks, you should be able to make a more informed decision regarding your purchase. This increases the chances that you’ll end up with a kayak that you really like, which in turn means that you will likely be happier with your purchase regardless of whether it’s a sit in kayak or a sit on top kayak. Just remember to consider how you’re going to use your kayak and tailor your buying decision around that idea.